If you’re already the proud owner of a Nest Cam IQ Indoor, we’ve got some good news for you. The smart security camera has just had another function added to its (already extensive) armory: It’s now a smart speaker. That’s right, you can now talk to your Nest camera as if it were a Google Home Mini, asking it all the usual weather based questions, setting events in your calendar, and even controlling other Nest-compatible products. The update is only coming to the Indoor version of the camera, which makes sense, because you don’t really want strangers to be able to walk up to your security camera and get updates on your schedule. 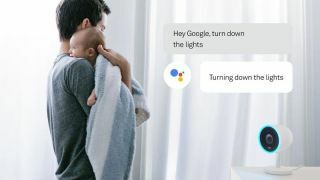 Although the timing looks interesting – coming just weeks after Nest announced it was becoming a part of Google again – this update has been a long time coming, having been initially announced last year. Along with the Google Assistant update, Nest announced that it’s adding an additional payment option for Nest Aware, its subscription service that lets you watch back recorded footage. Up until now you’ve had $10 for ten days or $30 for 30 days payment options, but now there’s a $5 for five days option. It’s less money, but it’s not actually any cheaper, and considering the Nest Cam IQ is already an expensive camera, it’s unlikely to draw in new customers. The camera comes with a three microphone array and speaker, which up until this point has been used for two-way audio, and should provide a good smart speaker user experience for simple requests, but don’t expect to use it to listen to an album, it will be more of a periphery Google Assistant product for controlling your smart devices.